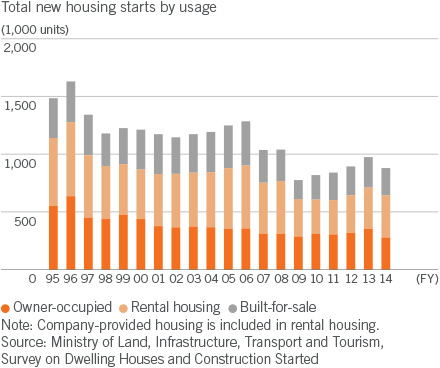 Since peaking at 1.63 million units in fiscal 1996, new housing starts in Japan have continued to trend downward over the past 20 years or so. With the size of Japan's population expected to decline further over the long term, housing starts will continue to fall modestly, with a figure of about 800 thousand units projected for fiscal 2016 onward. In fiscal 2014, housing starts fell 10.8% year on year, to 880 thousand units, owing to weak housing investment, particularly in owner-occupied housing, in response to the previous year's surge in demand ahead of the increase in Japan's consumption tax in April 2014. Among new housing, the move toward rental housing is projected to gain momentum going forward, reflecting demographic changes in Japan, such as lower birthrates, an aging population, and growth in the number of single-person households, as well as greater lifestyle diversity among consumers. 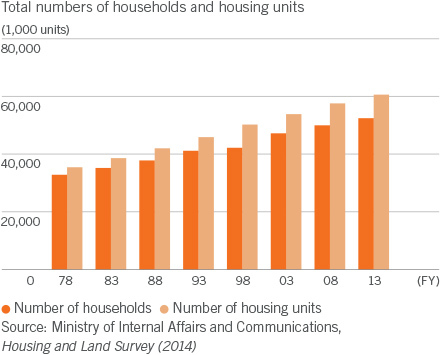 In Japan, the total housing stock already exceeds by 15% the total number of households. As of 2013, nearly 8.2 million units were vacant, and this number is expected to rise. However, the market for buying and selling existing homes in Japan is much smaller than comparable markets in Europe, the United States, and other developed countries. Sales of existing houses as a percentage of total house sales were 14.7% in Japan in 2013. Although the ratio has been rising in recent years, it still remains at only about one-sixth the level in countries in Europe and North America. Since the mid-2000s, the Japanese government has backed housing policies that put emphasis on housing stock, with a stated goal of expanding the scale of Japan's existing housing and renovation markets to ¥20 trillion by the fiscal year ending March 2020. To reach this goal, steps are being taken to increase the amount of quality housing stock usable beyond a single generation, coupled with efforts to put in place housing markets for circulating and renovating existing stock. 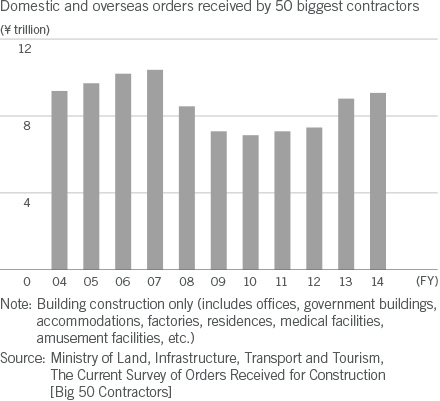 In Japan, total orders for building construction, including office, commercial, industrial, and residential construction, placed with the 50 biggest construction companies in fiscal 2014, rose 3.8% year on year. Overall orders increased for the fourth consecutive year, supported by brisk demand from the private sector—particularly manufacturers—as well as higher orders from public institutions. Most real estate developers are moving ahead with plans for new development projects, spurred on by improved corporate earnings and declines in vacancy rates among largescale office buildings in central Tokyo. Consequently, in a period of roughly five years from 2015, Tokyo's 23 wards are expected to see the supply of office floor space exceed the average seen between 1986 and 2014*1. Housing demand in the United States has gradually been recovering against a backdrop of a higher employment rate and an improved income environment. 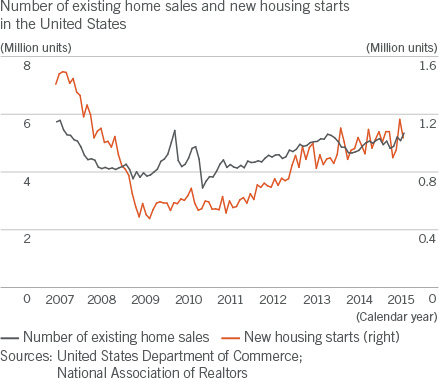 The housing market as a whole has remained buoyant despite a period of temporary weakness attributable to weather factors, with new housing starts on an uptrend and the number of existing-home sales in May 2015 approaching the level of November 2009. If the Federal Reserve Bank raises interest rates, housing loan interest rates are also likely to rise, but the housing market is expected to remain on a recovery trend as consumer sentiment improves amid growth in employment and incomes. Substantial room for growth in housing investment is also implied by the low ratio of housing investment to real GDP, despite gradual recovery after the sharp decline immediately following the financial crisis. European countries have made steady progress with structural reforms and fiscal consolidation to calm the situation after the debt crisis, but recently Greece's debt problems have clouded the outlook. 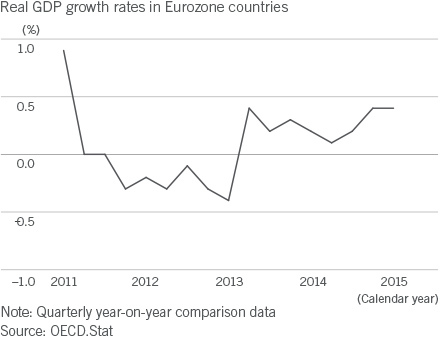 However, real GDP in the Eurozone has gradually been recovering. In addition, monetary easing led by the European Central Bank has been drawing funds into the real estate market, and investment inflows have also been strong from overseas countries, including the United States, emerging economies, and Middle Eastern nations. As a result, the value of transactions of commercial real estate has been growing, while office building vacancy rates in Paris, London, and other leading European cities have been coming down. In London, in particular, the development of several large office buildings has been moving forward since 2014 and the office real estate market has been on a recovery trend supported by growing demand from corporate tenants across a broad spectrum of industries. 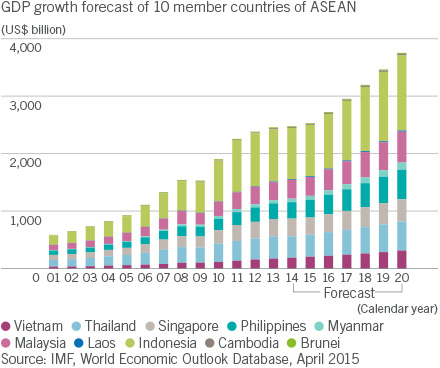 In the ASEAN region*2, where the population had reached around 610 million people in 2012, GDP growth is expected to continue supported by consumers' strong appetite for spending and impetus from the scheduled establishment of the ASEAN Economic Community at the end of 2015. Over the medium term, high population and working-age population growth rates, as well as vibrant corporate activity in the region, are expected to feed through to growth in the housing and office and commercial building markets. In China, meanwhile, the real estate market contracted in the first half of fiscal 2014 as GDP growth slowed and the government implemented tightening measures. Although conditions remain weak, the market appears to have bottomed, having sustained a gradual recovery since the second half of 2014.